Where do men come up with this stuff and WHERE do they get their impecable timing??? I still love it and think you look amazing! Warning: Randomness ahead...where in OK do you live? For some really strange reason, I was thinking that you lived in Tulsa (however, I'm quite good at convincing myself of things that I have apparently made up). Reason I'm asking...we're headed to Tulsa in two weeks! It's always the worst when we know they are right, but don't want to admit it! You get used to it and once you do, I am sure you will be so glad for the lovely change! luke and dale need to take "comfort classes"...something to teach them to be compassionate with mini-breakdowns. this blog made me laugh out loud...i've been there, friend. you're hair does look cute, it'll take some getting used to. i even have outfits i don't want to wear anymore because i don't have the hairdo i used to have to go with them? it's okay to tell me that i'm weird. then--i wake up some days and love having a "hair style" instead of just longer hair cut into some layers. love you friend! hang in there! Girl - your hair is TOO CUTE!!!! Isn't it funny though how ONE STATEMENT can snap you back to where you need to be?!?! It's different for guys, though. Girls worry about these things! You make me laugh. Not about the hair-stressing (that is totally understandable with such a big change - although I could not love it more), but just the way you relay your life information to your adoring readers. Love the hair. Love the girl. Love the blog. That about sums it up, my friend! Your hair is beautiful and so are you. Inside and out! Good thought....do we identify ourselves with Christ or the outward appearances that mean so much to us!!! Awesome! Seriously your hair looks fabulous! It's so chic and fun! Just pray about it because over the summer I was in the exact situation and that is truly what got me through! Now I laugh at how silly I was! Your hair looks fabulous! No worries! It just takes time to get use to it. Two summers ago I chopped my hair and highlighted it blonde. It was VERY different for me, but it turned out okay and everyone loved it! I did cry about my hair too because I wasnt use to it and I thought that S would hate it! In the end its just hair and it does grow back, but as a girl I totally understand hair crisis. I hope you feel better about it. I kind of freaked a bit when I cut my hair, but I love it! Now I am furstrated because I feel like it is growing out too fast. Anyway, Luke is right, hair is just hair and don't let it consume anymore of your worries - you're beautiful, and it will for sure grow back! Wow he just brought you back to reality...us girls always do that; we freak out about our silly hair. It will grow out; and it looks fantastic...change is good! I'm currently doing "A Heart Like His" (BMoore) on the life of David, and of course this reminded me of the words that the Lord spoke to Samuel when he was figuring out that David was to be anointed next king. "Man looks at the outward appearance, but the Lord looks at the heart." I Sam. 16:7b And He sees your sweet heart. So you go right on with your bad self and that cute hair, but keep remembering that your identity is in Christ sweet one ~~ it so is!! Isn't it funny how all girls do this!?! You got a great cut and it looks fantastic!! "Sometimes I look in the mirror and scare myself" literally made me laugh out loud. At work. I love this! It's exactly how I felt after I took the plunge (a month after we got married, b/c I was sick of my long flowy locks) and cut 8 inches off!! I was SICK! Then I loved it and now I'm in the middle phase and am so not loving it. Ugh! Oh well! Your hair cut looks amazing! You have NOTHING to worry about. And I am loving the color. You look great!! You're too cute, it looks fantastic! I plan on cutting mine soon too...it is scary! You are so funny! I love your hair and you will too once you get used to it! :) And Mr. Cup always says the most random things when I'm in the middle of a personal "crisis." Hope you're feeling better about things now. I think you look beautiful!! P.S. Thanks for your sweet email. I'm going to respond soon! megan, your hair cut looks awesome! I really love it! and the color! and don't worry, it's not short enough to be described as "the girl with the short hair". 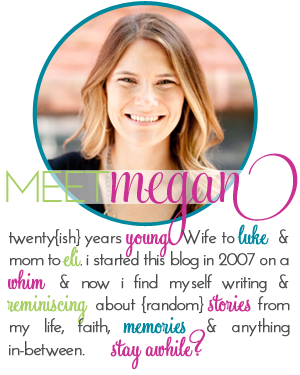 <3 ur blog! layout/template is way cute! Thanks for sharing this wonderful blog of yours. Keep up the good work. i'm quite sure i'll learn a lot of new stuff right here! looking forward for the next!